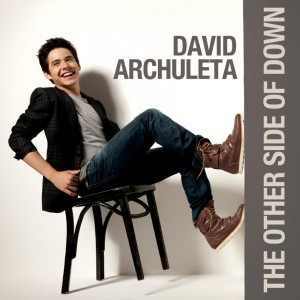 This entry was posted on Sunday, August 25, 2013 at 11:45 PM	and is filed under @DavidArchie, @kariontour, @McKenzieHarr, David Archuleta, Editorial, Guest writers, Management, Mission. 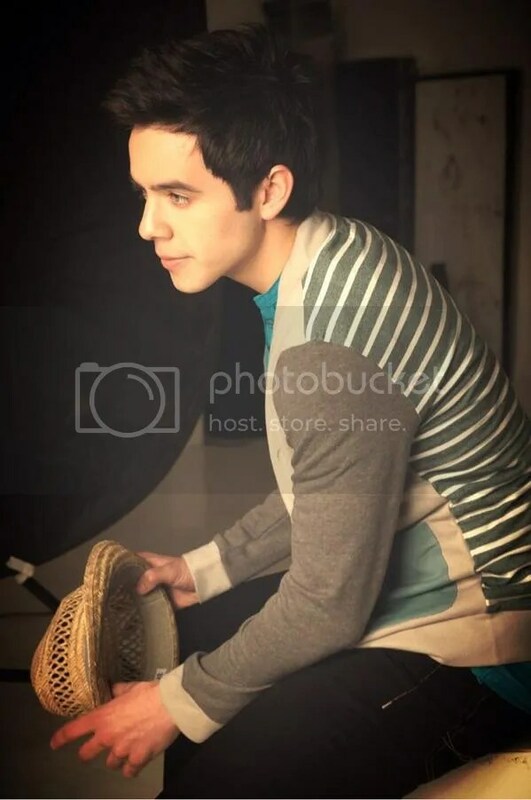 Tagged: #DA2014, David Archuleta, the Voice. You can follow any responses to this entry through the RSS 2.0 feed. You can leave a response, or trackback from your own site. Love this. There is so much I agree with in this but two things really struck me. This is so true. You made a great point, in one sentence, that I wrote a whole article a while back trying to make. After being gone for two years growing, maturing, changing he can come back and start fresh. The world will be wondering how he’s changed and might be ready to take a closer look at the man and artist he has become. If he has the backing to get his sound, his music, out there, he has a really good chance to make it. Like you said, it’s going to depend on the team he assembles going forward. 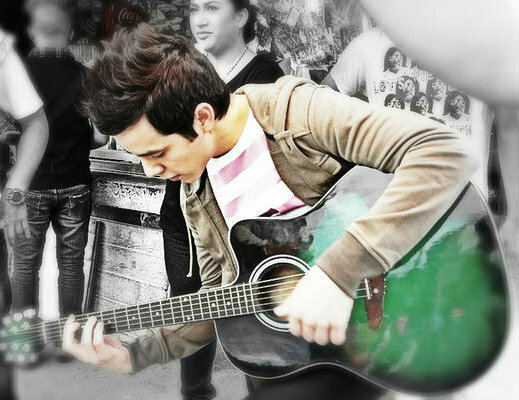 He has the talent and charisma. Now, it’s all about promotion and marketing. I agree. (And I really love that last sentence.) When he finds a team/label that has as much faith in him as his fans do, there will be no stopping him. I’m hoping that by the time he returns, he’s decided what that “sound” is and is ready to let the world hear who he really is. I can’t help but think of ‘BEGIN.’ reading what you said. Who knows?.. perhaps there was more, to the title of that CD then we thought. 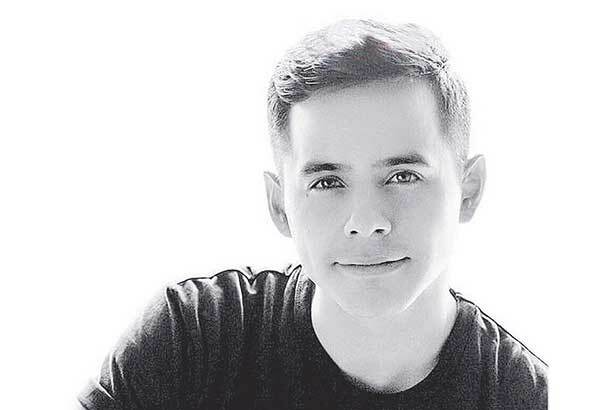 David has given us so many memorable moments since Idol, but he lived in an absolute whirlwind, for years after his Idol journey ended.whew! he has said to us, he can’t wait to see the person he becomes, after 2 years. :)) All I know is that whatever he decides to do,I will follow that voice anywhere it wants to go. Rooster, I agree totally with your comment about the VMA’s.Spot on brother!! the whole thing was a train wreck. 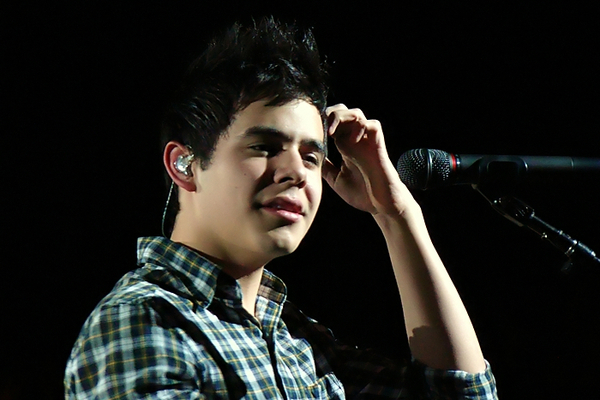 Thought about David on stage in Manila concert,his voice so beautiful, and strong through such a long set!! I spotted Kari!! she was on for a nano second,backstage with InSync anybody else see her? Agree about the VMAs. Complete train wreck from GaGa to Miley. (Although I liked JT.) I understand wanting to “put on a show.” But seriously, what are they thinking?? 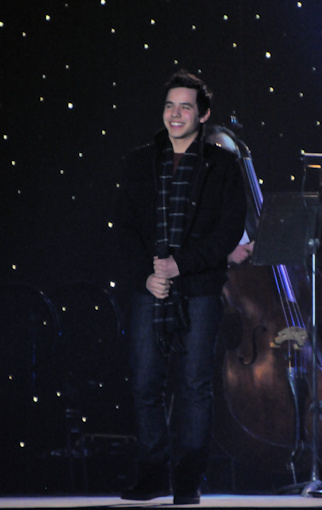 Such a contrast to watching David perform, not only with incredible vocal talent but with class and style. No need to be OTT. Just sing great! Tasteful and classy. I’m glad David knows what those things mean. I also feel the two years of the mission will be helpful for him, for the reasons you talked about and for the opportunity it gives him to “take his time” to figure out the best path to follow on his return. He is busy with other things, but at the same time, I am sure he has really had some great “conversations with himself” about where he is headed. For me, I am excited to see where that path leads as it Will be a good place. Thanks McKenzie! 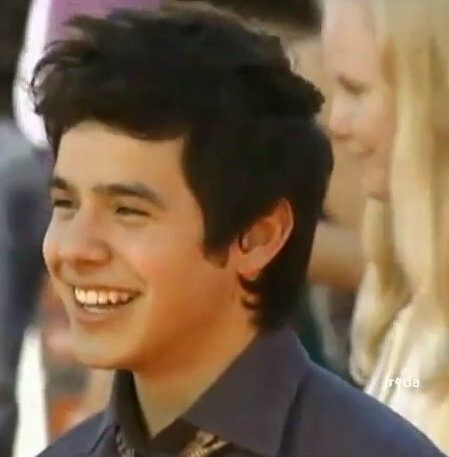 I remember the first impression that I had of David. They were never to be any more powerful than those times. The first night he sang “Imagine”, the night in Toronto, his performances with the MOTABS. This guy never needs a second chance with the first being so powerful. From the awards show, you can see that it is not David and the impression he can give but just how poor the industry is at this time. David has religion as a big part of his life so where will he fit in? It may be more the state of the industry that will make the difference. Has it changed since he has been away? Perhaps a little more crazy. A good number of singers take breaks, have a couple of years separating their albums. Could David, coming off of a religious mission fit in to the mainstream of music? That is what will be interesting. He is in need of nothing but a person who believes in him, someone well known, someone already famous who will see him to where he wants to go. They should match his abilities and professionalism. Didn’t mean to say ‘should’ in a sentence of instruction on anything David does. He knows the way. It is a shame that Miley has to go that far to get attention,Thats one thing about David he has good morales , and a perfect singer !! McKenzie, I agree with so much of what you said. 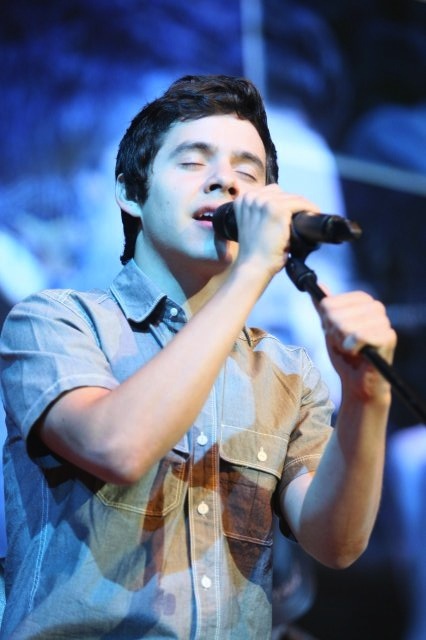 His voice is so exceptional, “he can do things with his voice no other young singer can”. Who else can melt his voice right in with the instruments when sometimes you can’t even tell the difference! With his modest personality, it will be a breath of fresh air to see and hear him when he returns! SB, Yes, I also think he is in need of a person who believes in him to help give him a boost to where he wants to go. With Kari being the tour manager to both David and JT, I think it would be a big boost for David to tour with him. I heard that JT put on a good showing last night. A real class act. McKenzie, great article. I agree with you… totally! I can’t wait to see who David brings back to the stage when he makes his return!! It’s been my thoughts all along, also, that his management just hasn’t been there for him. Don’t you just want to bang their heads together and shout in their ears until they finally wake up and ‘hear the music’?!! We, as fans, just have to keep doing what we are so good at…. support him! I’m so glad that I missed the VMA’s last night. I watched part of Miley’s mess this morning and had to close it down, it was making me ill. It’s so sad what has happened to her and so many others. I’m so grateful I’m a fan of a young person that has such good standards. Thanks to everyone for the comments. Glad to see how upbeat everyone is about David’s career prospects. 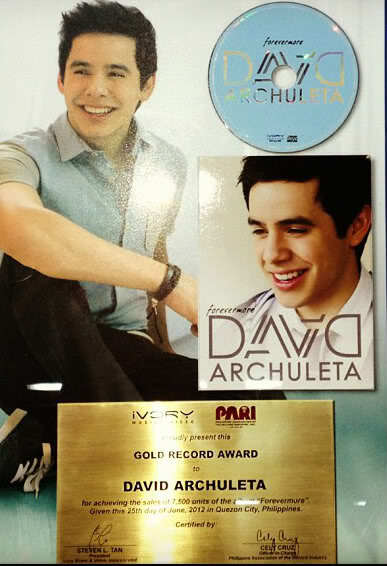 I’ve never had doubt in David’s talent or marketability. I have, however, had doubt about whether he has surrounded himself with the right people to help him achieve success. This is not to say that the people managing David are not good. Their records of success with other artists speak for themselves. However, this does not mean that they are right for David. I’m by no means an expert and do not have all the facts but I thought the marketing strategy during the TOSOD era just made no sense for David. 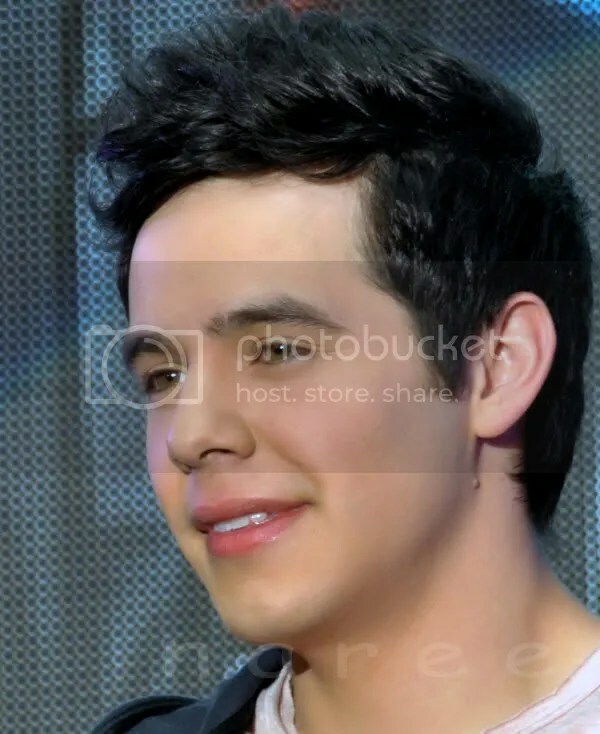 Rather than continuing to market David as a teen idol, it may have been more in keeping with David’s own personality and talent to market him as the “anti-teen idol”. The anti-Jonas Brothers, anti-Aaron Carter or even anti-nSync (who were not as “hot” as they are now). The timing was right for such a because 2010 was when the Jonas Brothers were over-saturated and fading and the public was probably ready for something different. It’s the approach Simon Cowell has tried to use to market his X-Factor group Emblem 3. 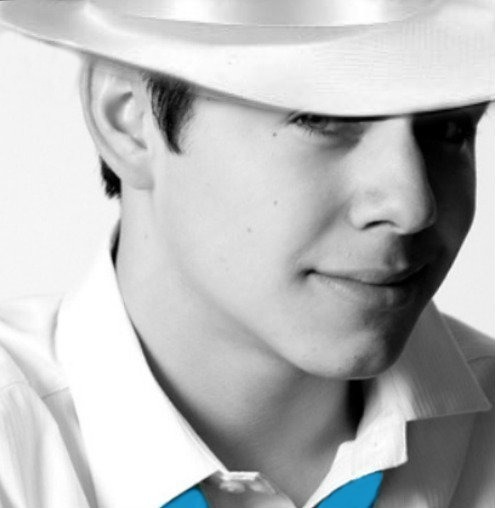 Instead, they marketed David as another teen Idol and were swept away in the Bieber craze. Taking a quick peek will comment later. Great thoughts Mckenzie! At work today I was listening to TOSOD on my phone when “Who I am” came on, I stopped and really listened to the words. He was screaming out his frustration with his treatment by his management and label. Wanting to take back his career and his life that had gone into a blender since coming off Idol. And no one’s gonna find me. Finally he did make up his mind to take control. He finished up all his obligations to his job and his fans. We are so excited for you to BEGIN. My thinking is, the only person who can manage to David, is David himself. 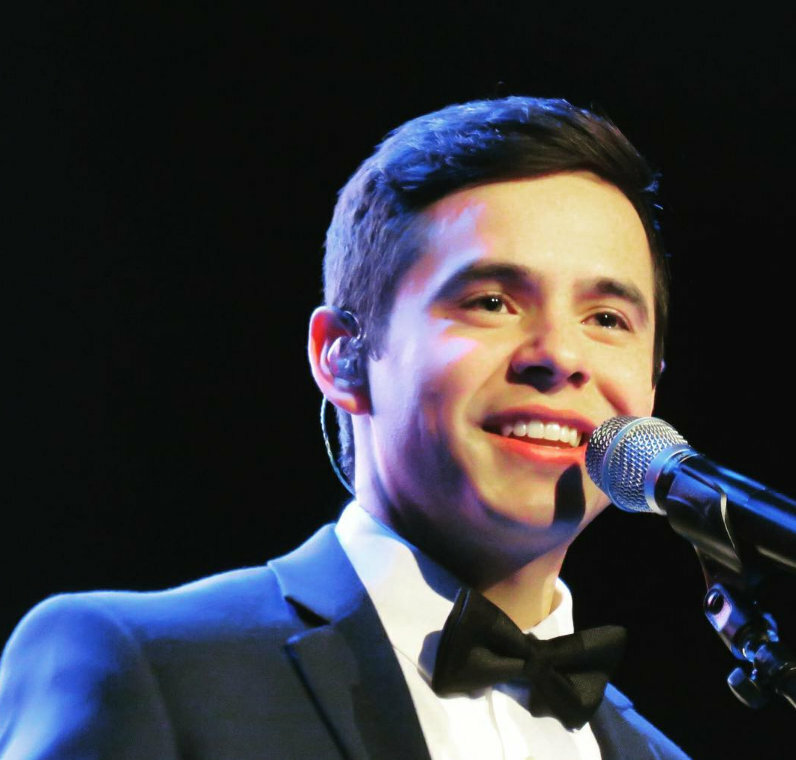 When David is aware of his own fame, and the feelings generated by his voice, that is the first step to a successful David and prolific in the music industry. This conversation was somewhere in Chile. -Elder, we can take a picture?? -I do not know, some girls have uploaded photos to facebook and I have been informed about this. -But Elder, we all took pictures, way you can not? -I do not know why it is different with me. Great insightful comments, McKenzie, and it created many comments from our posters. Thank you! I agree that perhaps David hasn’t had the right people managing him and therefore he hasn’t really been discovered yet. We have a musical genius here with the voice of an angel! Why the industry hasn’t taken notice yet is beyond me. Surely there is room in this crazy industry for his kind of talent. Not every artist out there is a rap singer or a hip hop artist. In my wildest daydreams I see myself screaming out loud, “Will you please listen to his voice!! !” But I feel like nobody is listening. But what I want is irrelevant. I trust David to figure it out when he gets back. I believe he had things standing in his way before but now he can get back to business and realize his potential. His talent cannot be denied! Join us tonight for Nandito Ako. We’re starting at the beginning, again. Meanwhile, enjoy this playlist of videos from TV5 Philippines. I agree. 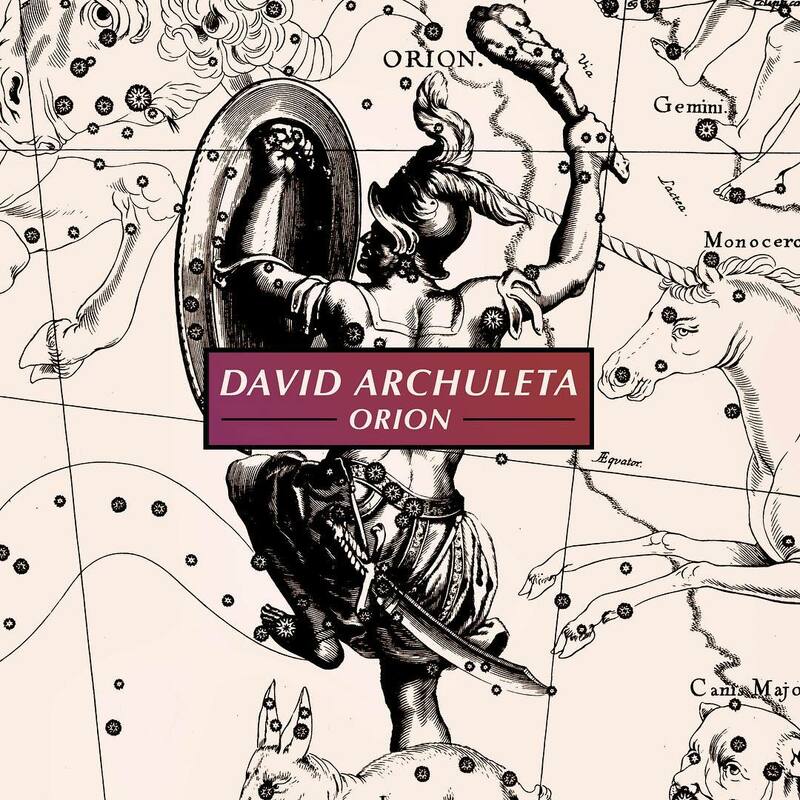 I think there are a few songs on TOSOD that were David’s rebellion at everything during that time (Stomping The Roses is another one) and that album may also have been his way of saying that he needed to get away from it all for a while. (Leave it all behind me, And no one’s gonna find me) You can hear his frustration in some of those songs. I really hope that getting away from it all, leaving it all behind him for a while, helps him to find himself and figure out where he wants to go. Good question. And as with everything else, I have a theory about that. (LOL Don’t I always??) But I think I’ll keep my mouth shut on that one because I think EVERYONE would disagree with me. HI! I don’t comment much but I have to put my two cents in if that’s ok. First of all, thanks so much for this article! Been reading in some places that some people questioned David’s ability to move his career forward before he left, that his decisions weren’t wise or his management was irresponsible, etc. Does anyone think that maybe he didn’t want his career to skyrocket at that time? He didn’t want to be put in a cookie cutter….maybe there was something else he wanted to do first? Something that he had wanted to do since he was little? like go on a mission? Maybe he was surprised by all that happened and needed to put the brakes on… slow down… He had been in the music scene from the time he was 10. I wonder if he ever wondered who he was without music. I am soooo happy he gets to have this time for himself! For others! It will be a wonderful foundation for the rest of his life! He will have a greater sense of who he is and what direction to take. 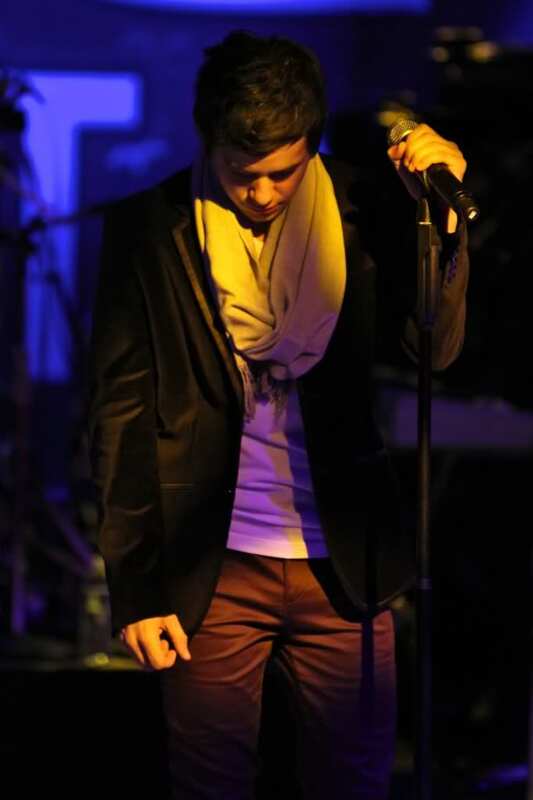 His talent goes way beyond what we have been seeing in the pop scene. His gift was given to him for no reason. .. There is a plan and David will discover what that is and how to go about fulfilling it. Hope you guys don’t mind me going there.. but that’s what I believe. He is a gift and if he uses his talent for the right reason, he will go very far and bless many lives. He is unique and should never try to imitate anyone! He is his own man! Excited to see “who” he brings back! 😀 Thanks again for the awesome article! Hope you guys have a great day! 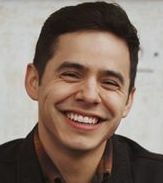 With many of the current teen idols achieving fame and then doing absolutely idiotic things that get them a lot of attention, I think that a David Archuleta is such a breath of fresh air. I hope the public will see it that way. 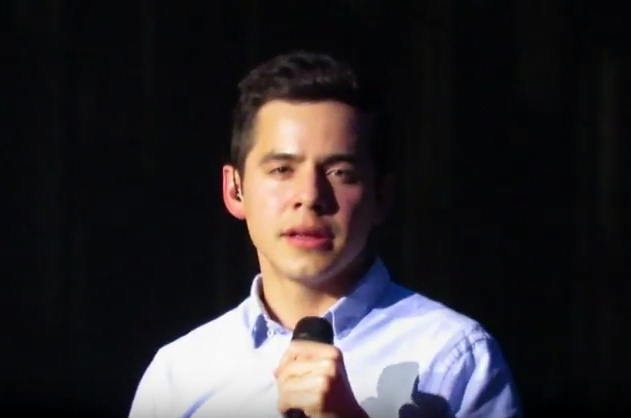 What is wrong with people who credit bad behavior with attention that’s not deserved and withholds it from such a wonderful human being that is David Archuleta. Wake up USA!!!! It seems that the rest of the world appreciates him.. What is wrong with this picture? OOPS! I meant to say… “his gift wasn’t given to him for no reason!” sorry! Haven’t commented in a while, but always enjoy coming to this site to read the wonderful articles and of course, check out the gorgeous pictures, lol. Munk_Ma, I agree with your thoughts about David needing to complete this part of his life that he had wanted to do, that might be the reason he held back, with mega fame, no way could he enjoy the privacy he is experiencing if he had a big career, say like (ugh) JB. One thing though, I will say that he isn’t ever alone, so time to himself might not be exactly right, lol. I do know what you mean, time away from the music industry. New post on my blog. Enjoy it. Bebe & Angelica, Ok, if you really want to know. Well first, it does seem that not everyone would COMPLETELY disagree with me. Much of what Munk said fits in with my theory. I really believe that it was David himself that held things back and that TOSOD was his way of rebelling, his way of letting the label and us know that he didn’t like where things were heading. He was contracted for another album and some of the songs on TOSOD were kind of “in your face” at the label, letting them know that he was tired of it and he was going to do what HE wanted to do. I think he’s a lot more strong-willed than most people think. He has his own plan, and I think he fought the label and let them know he wasn’t doing anything he didn’t want to do. I also think JIVE didn’t like it one bit, hence the not renewing the contract because they disagreed on terms. David said they “made him an offer” and I think he didn’t like what he would have to do to fulfill it. I think there was a fight going on that we fans knew nothing about during the TOSOD era. I think he let them know he’d be taking a 2 year hiatus for his mission and it didn’t fit in with what JIVE wanted. Could that be why they failed to support TOSOD? I don’t think they were happy with David and I don’t think he cared what they thought. Labels don’t like an artist that fights them. They wanted someone like Beiber or Miley who would do whatever it took to make money and he wasn’t willing. David taking this time to do something that’s been in his life plan all along was the best thing he could have done for himself. As McKenzie said, it gives him a “second chance to make a first impression.” Only this time, when he comes back and re-starts his career, the person and artist he presents to the world will be the image of himself that HE wants the world to see. He’ll be the kind of singer/artist HE wants to be. Right now, none of us really knows what that will be. I guess we’ll see in 2014. I think that’s when we’ll see the real David. We know the talent is there. The rest is up in the air as to where he’ll go with his music. 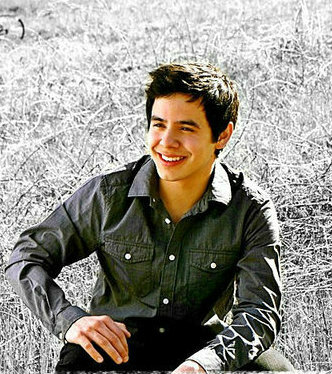 I think you guys are all freaking awesome and VERY smart when it comes to one David James Archuleta. Mckenzie, I so agree with what you said, the mission he always planned to go on is now a blessing in disguise, well not in disguise to us in retrospect lol. I’m with you 100% David needs to be David not an imitation of anyone else. I have not heard anyone with his talent, character, professionalism, humility and many other attributes anywhere. I do agree that all he needs is to surround himself with people in the business who believe in him and will carryout “his” vision and “voice”. MT, I agree with you! Abrra, MT and Rooster, TOSOD and BEGIN. are message songs to us. The more I listen to them the more I hear his cry, it kills me. Some say that we over analyze but David himself has always said he loves message songs, so why would he change with his own songs? He put himself, his feelings, what was troubling him and yes jive did not like it and let one of the best albums ever IMO fail. But like Kari said, “David will be back bigger and better” on his terms. I don’t see a pushover but a fierce young man who is true to himself above anything else. Munk and CQ, your comments are always welcomed. It’s great to see so many of us on the same page. David’s destiny won’t be denied. Like Gladys, I think the only person who can manage David is David. The impatiently waiting (aren’t we all?) DJA adds “I don’t see a pushover but a fierce young man who is true to himself”. We watched him evolve from the youngster who wanted to please everyone to the young man who knew he needed to take charge of his life. The time he spends on his mission will stiffen that backbone even more. I am excited to see that person come back. Loved this topic from McKenzie and the thoughts she explored. Nothing better than looking forward to David’s return. Makes my insides bubbly. I just know if David is happy, we are happy. Golly, I love this place. Munk, What you said is exactly what I have thought since he went on his mission. I think that he has held back for the reasons you have suggested. I agree with you 100%. MT, I guess we all come from the same school! I wholeheartedly agree with everything you said! 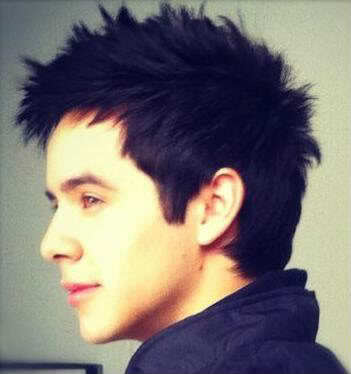 By the way, I forgot to say that I love that lead off picture of David. ♥ And #15 photo is one of my favorites! Thanx Abrra! 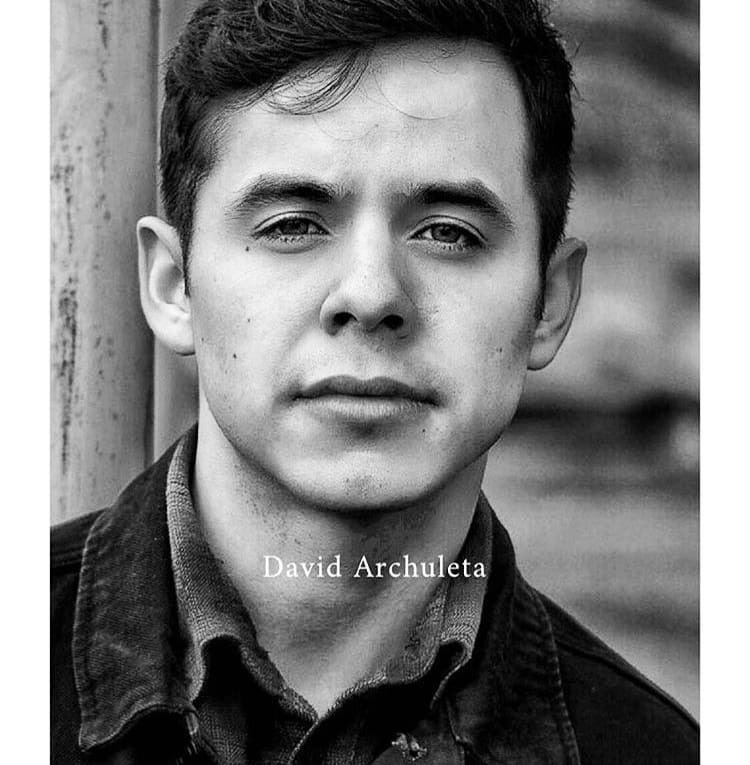 McKenzie – loved the article and I agree that David needs good management and a supportive label that respects who he is. MT – right on! You could just hear that little “buzz off” to JIVE during TOSOD – David was never going to be like Bieber (Oh, thank you God!) and had more self-respect than poor Miley will ever have. But about the music, the songs… David brings the songs to life with his emotions, his voice, his interpretation. That is why his songs are so much MORE when he sings them live than when recorded. I remember his first album coming out and I thought, Oh, okay, the songs are fine. But when David performed them on tour, they sprang to life, became catchy or solemn or simply amazing because of what he did with them. And then there is the “problem” of his versatility. It is a problem for marketing. I hope David finds a guru who can create a marketing plan that promotes appreciation for that amazing skill of being able to sing any genre of music, to be a little rockin’ jumpin’ Zero Gravity guy one minute and sing Contigo the next, to make you smile when he whistles in Your Eyes Don’t Lie and tear up when he sings Ave Maria. I think THAT is the main issue for David (if you want to call it an issue) in garnering wide-spread public recognition. He is a musical chameleon (in only the best sense of that concept). He can do anything. I’m not sure if I care if that happens for David unless that is what he really wants. He can have a fabulous career doing what he loves, touching people’s hearts, gaining followers one at a time. I think he will be the kind of person that has an enormous body of work that is eventually recognized with a lifetime achievement award, but may never be hitting the charts (do they even count anymore?) all the time. I agree. Touring with someone big, like JT would certainly put David in front of a lot of potential new fans. More people need to hear that fabulous voice of his. Hello all! :). I’m really loving the theme of this post! Very soon the excitement throughout the fandom in anticipation of David’s return will start to build and intensify it’s going to be crazy!! I CAN’T WAIT! With that out of the way, here’s my 2 cents: I believe that David WILL come back strong. “Let’s hope that David comes back roarring” I heard a dj say once during the reporting of his “drop” by Jive. And come back roaring I believe he will. All I have to do is picture in my mind that crazy awesome performance of his of The Eye of the Tiger so deliciously described by our dear Gladys. Listen to the words of the song. The man is determined and ready! I’m of the camp that understands that the mission is something David had to do before he could be able to go full speed ahead with his career. There will be lots of buzz, interest and curiosity as to what he’ll do upon his return. I believe David has gained, because of past experience, knowledge and wisdom as to what needs to be done career-wise in order to build strong. 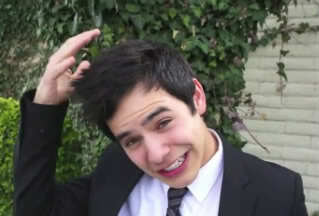 And I am so anticipating the whole new experience of that new David coming back to us. The only fly in the ointment of this wonderful future is this: In the past, David had been fairly accessible to us. Will we still be able to get as close to him? To look into those eyes? Bask in his light? Touching his hand is on my bucket list. Will I be able to one day check that off? I would guess yes! I do think there is going to be absolute craziness trying to get those VIP tickets though, I can’t wait! I was in complete spazz mode at Ross today! 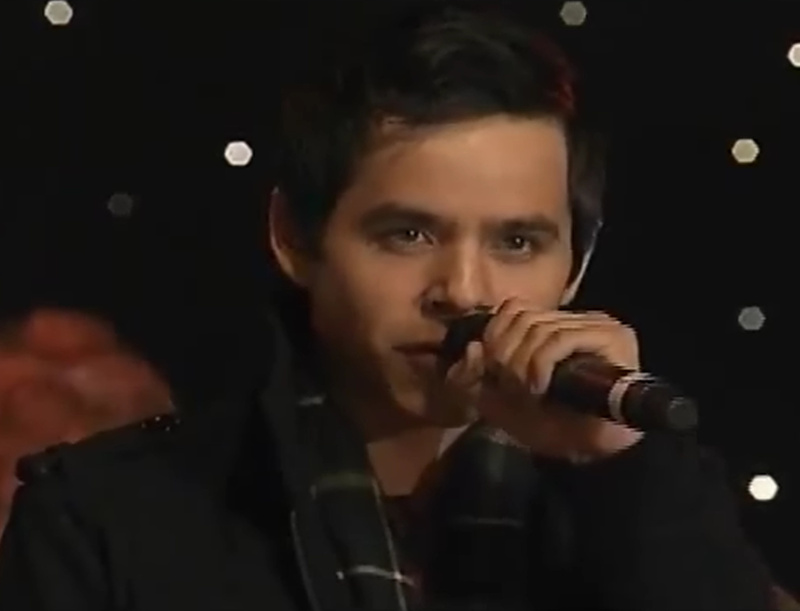 David Archuleta singing Crush playing! That wonderful voice coming through the sound system! Three of my grandkids recognized him and all turned to look at me lol One said, “Grandma turned into a young girl” haha. Kari mentioned on twitter that she took this picture. Nice job Kari! Love coming here just to read the title. 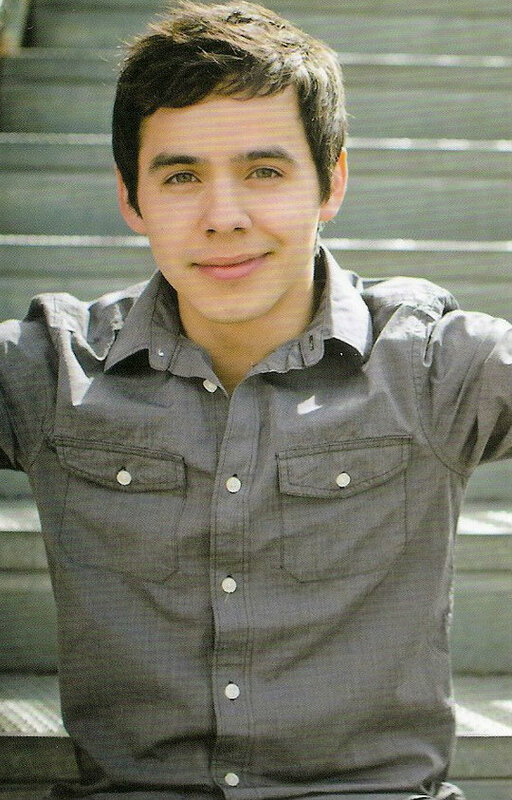 David Archuleta ~ Coming Back Strong Yayy!! And the pics. And the video. And all the nice people saying all those nice things about David. Nothing to argue about. Just feeling the love. 46. Thanks for posting that, Abrra. He looks older, more serious. Really nice picture. McKenzie, absolutely love your comments! You are much more knowledgeable about the current music than I, and I really enjoyed your insight. 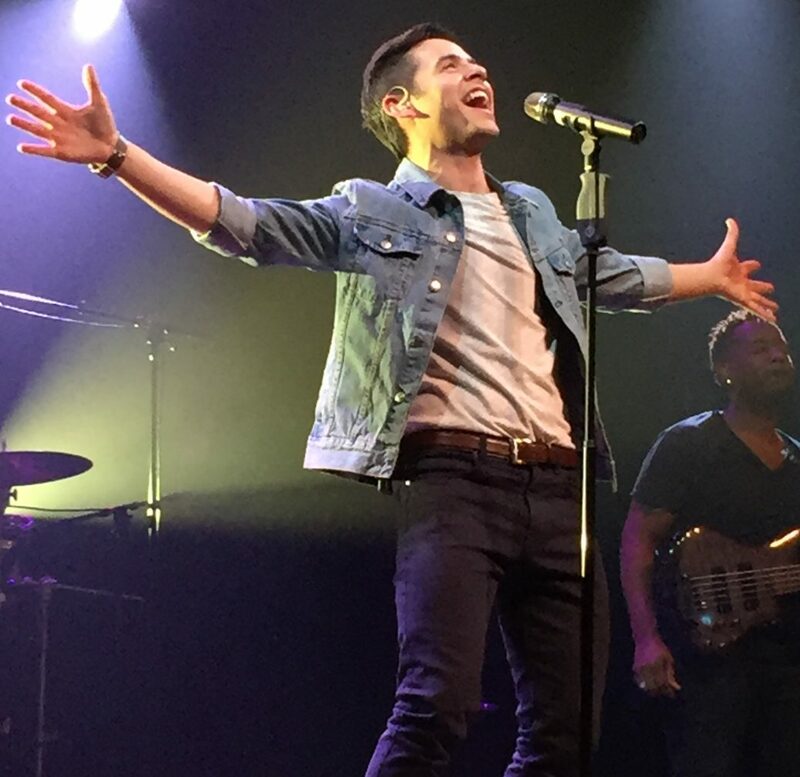 The David Archuleta Sound – THIS is what I have been waiting for. I’ve always had this nagging feeling that he does have his “sound”, something he wants to do or has been waiting to do when he is older, while sticking with more pop while he was younger. But I truly hope when he returns he just goes for it……his sound, his style, with that DJA groove that only he can do! But as Marlie said, I also love his versatility – and if marketed correctly could really show what a rare and unique talent he is. 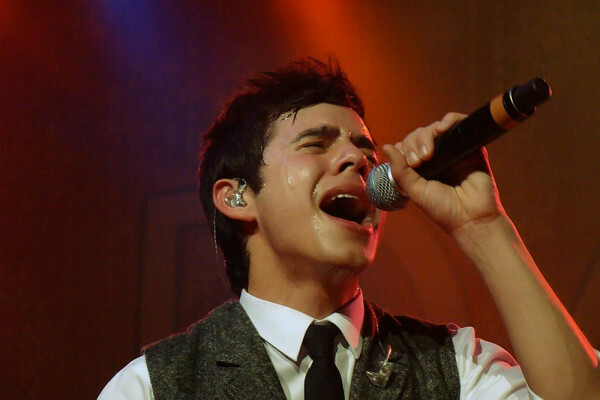 Cruisin’ through the Archuleta archives…my goodness, I MISS him so much! McKenzie, just chiming in here to say how much I enjoyed your article (which I have read about 4 times now), and how much I agree with what you said. There are too many worthy quotes to list here, but I especially love the overall tone of absolutely unconditional support for David. Thanks to those who came. We had a blast! Abbra… you are such a party girl! The end of August. Another month gone. A year and a half ago I wondered how we could possibly continue with this place. How many ways could we comment on David’s voice, his looks, his genius, his character? How many times could we watch the same videos and still want to see them again? How could we keep interested in someone whose life is so inaccessible when we had kept track of his daily wardrobe? Yet here we are. We have found a million (more than a million?) things we want to talk about. It didn’t hurt that he left us 2 complete albums after telling us his goal was to “record a few songs” before he left. Abrra captured his Philippine novella. The fans are still creating new videos from past performances. New pictures surface. We continue to find the need to check in here to see what has surfaced. I am no good at the searching, but have so much gratitude for those who bring David’s essence here. Gladys’s account of seeing David in Chile meant a great deal to me. Abrra’s Saturday night chats and Bebe’s Nandito Tuesdays are wonderful. So many people here that spend so much time and effort to keep things current. The artwork is outstanding and always beautiful, the articles always interesting, the comments fun. The ways we find to share our appreciation of David’s talents are endless. Thanks to all who join in.